Kelys & Chirp is a joyous celebration of friends. It is itself a union of Chirp and Kelys, two unlikely companions living happily together, and was developed as a co-creation by two Friends: Reuge and Nicolas Court. Kelys (from the Greek chelone or chelys for tortoise) moves in a realistic tortoise-like gait with his head moving slowly side-to-side, his movements all in synchronicity with Chirp as springing from her nest and pirouetting, her beak opening and closing, wings flapping, and tail wagging, all in time to the melodic bird song. Turtles have long represented wisdom in many cultures because of their long life spans (up to 190 years). While Kelys is certainly wise enough (an integrated mechanical sensor ensures that he doesn’t walk off table or desk tops), it’s his playful streak that complements Chirp’s musical exuberance. While Kelys & Chirp may look relatively simple compared to a complicated watch, its 480 components (enough for a minute repeater) lie testament to the complexity within. This is where Nicolas Court and his team worked their magic: working around the Singing Bird, which is a complete movement itself, they faced significant challenges when developing the turtle automaton mechanism. The singing bird ‘Chirp’ is made of 18K white gold with eyes in sapphire. Chirp sings for 10-12 seconds, flaps her wings, moves her tail, opens her beak in time to the bird song… and then magically disappears. Thanks to unconventional gearing and cams, Kelys moves in a very realistic fashion. You can also enjoy a concert by Chirp without Kelys moving by pushing his tail up; with his tail down he walks while Chirp sings. The scales (turtles are reptiles) on Kelys’ shell are individually hand made from high quality leather in 4 different colours, creating a warmer and more natural feel than bare metal. Nicolas Court was born in 1970 in Moutiers, Switzerland. After qualifying as a micro-mechanic at the technical college in Saint-Imier, Court worked on Morbier and Comtoise clocks. In 1989 he moved to Sainte-Croix and worked at T.H.A. (Techniques Horlogères Appliquées), where he discovered a passion for haute horlogerie mechanical art pieces, creating Breguet sympathique clocks and developing luxurious objects for well-known watch brands. Sainte-Croix is not only known for horology, the town is also a cradle of mechanical arts including music boxes, automatons, and gramophones. Court met automaton collectors, which led to his now regular trips to China to repair and restore automatons. He also collaborates with other automaton makers in the region and develops music box modules for watch brands, working on projects under his own brand “Arts15". This devotion for mechanical arts led to several collaborations with Reuge, undertakings that paved the way to the design and engineering of Kelys & Chirp. 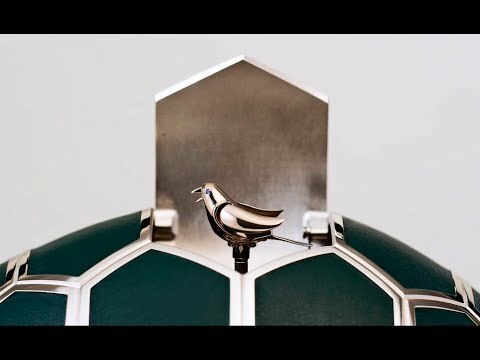 When the idea first came up of a turtle automaton with a singing bird on its back, Reuge – which had expanded from music boxes to also offering singing birds and who had developed MB&F’s MusicMachines – was the natural partnership choice. In turn, Reuge partnered with automaton specialist Nicolas Court to develop the mechanism that moves the turtle so realistically. The invention of the modern Singing Bird complication is generally credited to Pierre Jaquet-Droz (1721–1790). By 1785, Droz had both miniaturized the mechanically-controlled bird and developed a compact movement: his secret was in recreating a realistic birdsong using just one bellow of variable pitch rather than multiple single-pitch bellows. Kelys & Chirp is available in 4 limited editions of 18 pieces each in blue, green, yellow and ochre.